This Waterloo Industries 4-drawer workbench makes working in the garage an easier task by providing a sturdy and stable work surface. The heavy gauge steel construction is engineered for strength and durability while the full-extension ball-bearing sliding drawers allow smooth operation. 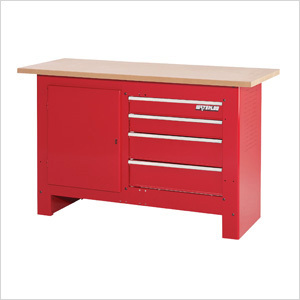 Like all Waterloo workbenches, this workbench is covered by a 1-year warranty.